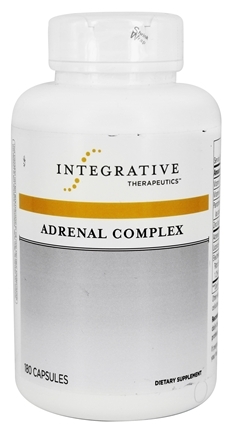 Adrenal Complex provides essential vitamins and minerals for adrenal gland function.† The combination of eleuthero,licorice,and adrenal extracts–along with zinc and vitamins A and C–supports the adrenal glands without stimulant ingredients that can add to stress. Take 1 or 2 capsules three times daily between meals or as directed by your healthcare professional. Gelatin,potassium bicarbonate,modified cellulose gum,ascorbyl palmitate,and silicon dioxide.